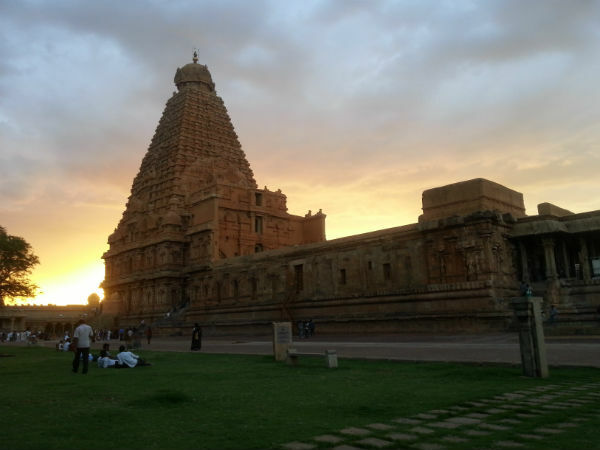 Brihadeeswarar Temple of Thanjavur stands as an epitome of Chola architecture. The temple, along with the Airavatesvara Temple and the Gangaikonda Cholapuram, has been accorded the name of Great Living Chola Temple and is a part of the respected UNESCO World Heritage Site. The magnificent architectural site shows the massive development of architecture of the imperial Chola dynasty. It is built out of granite and the tower (vimana) above the sanctum is the tallest in the entire South India. With a massive prakara (corridor) hosting the largest Shivalinga in India, the temple is the location that commissioned the construction of the brass Nataraja. Brihadeeswarar Temple was built in the 11th century. Its original structure included the main gopuram, sanctum sanctorum, frescoes, inscriptions and sculptures that were related to Shaivism, Shaktism and the Vaishnavism tradition. Thanjavur experiences a hot and sultry weather during summers. The monsoon is accompanied by low showers, providing relief from the heat; however, the best time to visit is during the winter season. Winters are cool and pleasant and host a lot of other activities. The temple is flocked by devotees round the year so it is best to plan the visit in advance to avoid last-minute rush. Thanjavur is connected to major cities by road and rail network. The place does not have an airport but tourists can reach the nearest airport, Tiruchirapalli, and then commence the travel by bus, taxi or train to reach Thanjavur. By Rail - Thanjavur is connected to nearby cities with trains; however, long distance trains are few. Jan Shatabdi Express has a stoppage here. The nearest major railway station is Tiruchirapalli and you can avail a taxi from here, directly to Thanjavur. By Road - Road connectivity is excellent in Thanjavur and can be accessed from various parts of Tamil Nadu along the state highways. Major highways like NH 45C, NH 226 and NH67 connect to cities like Coimbatore, Tiruchirapalli, Pudukottai, Madurai, Chennai and others. By Air - The nearest airport is located at Tiruchirappalli, which connects many national and a few international cities. The structure of the temple represents the Dravidian architecture. The premises were fortified in the 16th century and house a large Nandi statue at the entrance. The temple is known for the Ashta-Dikpalakas (guardians of direction) idols, beautifully carved sculptures of granite and fresco paintings of the mighty Chola era. The primary deity, Shiva, is located at the centre in the western square of the premises, and a circular ambulatory path is built around for the devotees. The inner chamber or the garbhagriha provides access only to priests. The ground floor hosts deities in all directions. Principal deities include Lingodbhava on the eastern side, Bhikshatana on the southern wall, Harihara and two dvarapalas on western side and Ardhanarishvara on the northern wall. On the second storey, Shiva's Tripurantaka is depicted in various postures. The upper storey wall is carved with dancing postures from the Natya Shastra, which forms the basis of Bharatnatyam. The ambulatory passageway is filled with beautifully painted fresco murals on every side. They depict the Chola culture, kings and divine stories. Inscriptions along with them give valuable insight of the culture and society of the Cholan era. The annual festival, Brahan Natyanjali, is hosted every year and lasts for 10 days. It is a cultural festival and involves performing arts, especially classical dance from all over India.